WIN a Personalised Reading Book for your child! Father’s Day is almost upon us and I’m delighted to be able to offer one reader the chance to Win a “My Dad..” love2read personalised book! Just imagine Dad (or Grandad’s!) face when he sees himself as the star of the bedtime story! Love2read enable you to use ten photos and text to say simple phrases ideal for youngsters learning to read – e.g. “My Dad likes cars..” There are lots of templates to choose from, you just select one, and follow the simple instructions to upload 10 photos and simple text! 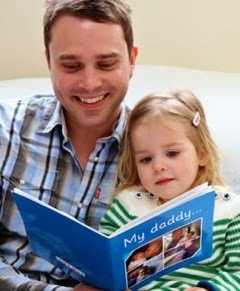 You can even make the name of the book more personal “My Dad”, “My Daddy..”, “Our Dad..” “My Hero..” to name a few! Want to enter? Follow the steps on rafflecopter below!